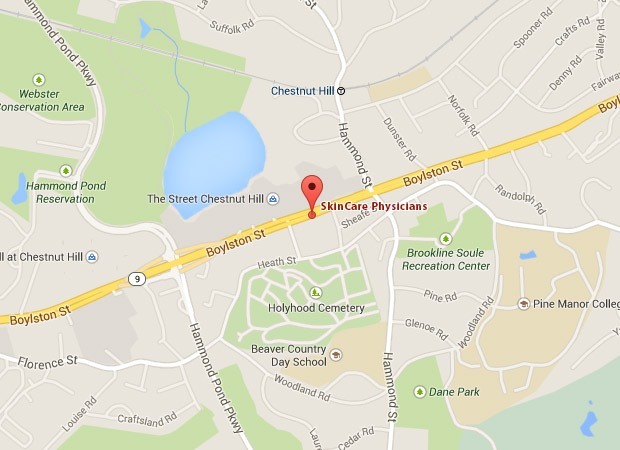 SkinCare Physicians, a Boston area dermatology practice, is located at 1244 Boylston Street (Route 9), in Chestnut Hill, Massachusetts, 02467. NOTE: Complimentary Parking is available in the covered garage as well as behind the new Bank of America building. To access the parking, take a sharp right just after the Charles Schwab Bank. Park in the covered garage or go to the back of the building where a parking attendant will direct you. If you miss the turn, take your next right just after the Skincare Physicians building and park in the back of the Bank of America’s new building. Please feel free to contact us online if you would like to visit a dermatologist at our office near Boston. Take Route 9 east towards Boston and Chestnut Hill. Drive approximately 2.9 miles to SkinCare Physicians of Chestnut Hill. Go through 4 stoplights in total, pass the Chestnut Hill Square on your right and the Chestnut Hill Mall on your left. After the 4th light (Tully Street/Charles Schwab), make a sharp right turn into the Chestnut Hill Plaza parking lot. We are in the same building as Fed Ex Office/Kinko’s. Enter the building from the front Route 9 entrance. Take Route 128 South to the intersection of Route 9 (Exit 20 A) and follow the directions in From the intersection of Route 9 and Route 128 printed above. Take Route 128 North to the intersection of Route 9 (Exit 20 A) and follow the directions in From the intersection of Route 9 and Route 128 printed above. Take the Massachusetts Turnpike to Exit 14, Route 128. Take Route 128 south to the intersection of Route 9 East (Exit 20 A) and follow the directions in From the intersection of Route 9 and Route 128 printed above. The other option is to take Route 9 in all the way, following the directions in From the intersection of Route 9 and Route 128 once you have crossed under Route 128 heading east. Go towards Route 9 West. From Storrow Drive, exit at Fenway and follow signs to the Longwood Medical Area. This will take you onto Brookline Avenue, where you will pass the Beth Israel Deaconess Medical Center. Follow Brookline Avenue to the end and the intersection of Route 9. The Brook House will be directly in front of you. Make a right onto Route 9 heading west. Follow directions below in Common End to Option 1 and Option 2. Alternatively, you can get to Route 9 heading west via Huntington Avenue (the Copley Place Mall). Follow Huntington Avenue to the intersection of Route 9 and Brookline Avenue. The Brook House will be on your left at this intersection. Continue straight thru the lights and follow directions below in Common End to Option 1 and Option 2. Stay on Route 9 for 2.7 miles and go through 12 stoplights. When you get to the stoplight at the intersection of Route 9 and Hammond Street, there is a CVS/ The Street Chestnut Hill as the landmark on the right side. Continue straight and get in the left lane to prepare to make a U Turn at the next light (Tully Street). Turn right into the Chestnut Hill Plaza. 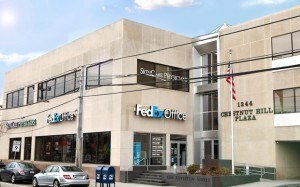 We are located in the same building as Fed Ex Office/Kinko’s. Take the Green Line “D” car to the Chestnut Hill stop. Walk towards The Street Chestnut Hill. 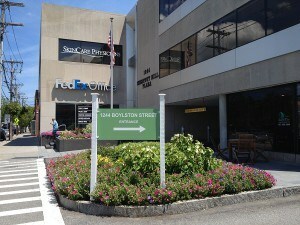 We are located directly across the street from the Container Store, at 1244 Boylston Street (Rt 9). Enter the building from the front, facing Route 9. Take the Green Line “B” or “C” car to Kenmore Square. Exit station and take bus #60 (Chestnut Hill) to 1244 Boylston Street, Suite 302 (The bus stops across the street in front of the Star Market just after the CVS).